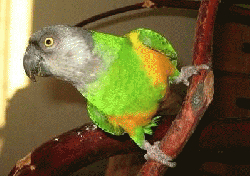 Nika is a gorgeous Senegal Parrot who enjoys her human companions and has some very sweet and funny antics. She is excellent at mimicking noises (kissy noises, clicks, beeps, whistles, and zippers!) and has some great vocalizations. She is a very funny bird and fun to communicate with. She can talk in something akin to baby speak including occasionally learning new words ("hello", "pretty bird", and recently "good girl"). She would do best in a low-keyed atmosphere.